Bron is a cron-like scheduler for BlackBerry 10. It executes shell scripts or system commands at the time specified by the time spec. It can display a log for your script if the script produces one. 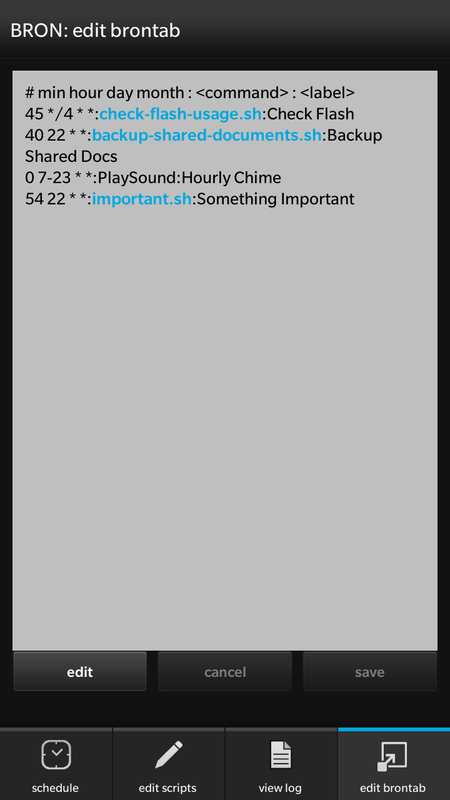 It can also create a Notification in your Hub if your script needs to notify you of something important. And that’s not all…. For the impatient, check out the screen shots! Bron reads a filed called ‘brontab’ to learn what it should do. This file is located at:/accounts/1000/shared/misc/bron/conf/. You can view and edit the file within the app, or you can open it in your favourite text editor. The fields are separated from each other by a colon (:) character. Leading and trailing paces are ignored. Spaces between words are preserved. the time spec is a cron-like expression that specifies an exact time, or a pattern that a specifies increments of time like “every 4 hours”, or “on the first of the month”. the script name is the name of a shell script to execute. scripts must be placed in the /accounts/1000/shared/misc/bron/scripts/ directory. this field should only specify the script name. do not include paths or command line arguments (coming soon in a future update!). Script names should end with a “.sh” suffix. Read more on the Scripts page to learn how to write a log file or create a notification in the Hub. The label is a unique label that identifies your script. The label is purely for aesthetics – to display a “pretty name” for your scripts. You can use the same command (aka script) multiple times as long as the label is unique.